GREAT TASTING! MIXES EASILY! FAST ACTING! EXCLUSIVE EPHEDRA-INFUSED PRE-TRAINER. 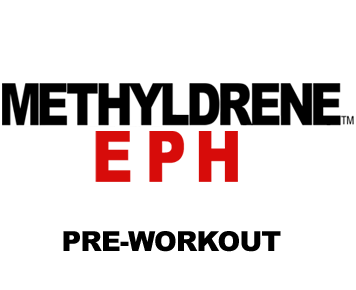 IGNITED WITH HIGHLY PURE CAFFEINE, DMAE & CITRULLINE! 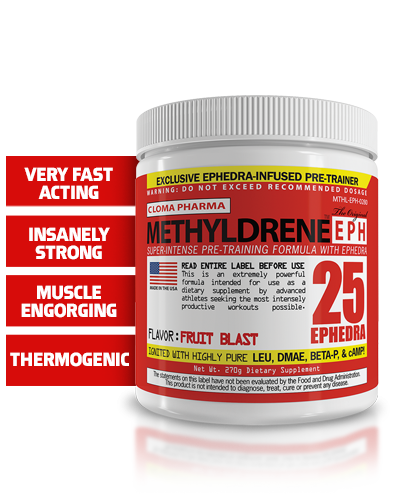 FOR INSANE WORKOUTS: Mix 1 scoop of METHYLDRENE EPH in water and consume 30 minutes pre-training on an empty stomach. Persons with a sensitive stomach may wish to consume a small amount of food rst. Start with 1 scoop and assess your tolerance before increasing the dose. OPTIONAL: On non-training (rest) days, use METHYLDRENE EPH to support energy and focus. For maximum impact, stop using this product for 1 week every 8 weeks. Never consume more than 3 scoops in a single setting or in a single 24-hour period. Do not consume within 6 hours of bedtime. 1 SCOOP TOTALLY DIALED IN! 2 SCOOPS LEAN MASS VOLUMIZING! 3 SCOOPS RECORD THREATENING,HEAD TURNING!